There are many incomprehensible facets to JaVale McGee, but the talent and seeming potential is unquestionable. Two balls, two baskets, one dunk. Enough said. He’s dribbling full-court again. Oh boy. McGee is also a young man to whom team owner Ted Leonsis refers, via his blog, as, “erudite and well-read and highly relevant.” Leonsis also used “erudite” when referring to McGee on media day. Makes me want to brush up on my Wordly Wise from sixth grade. 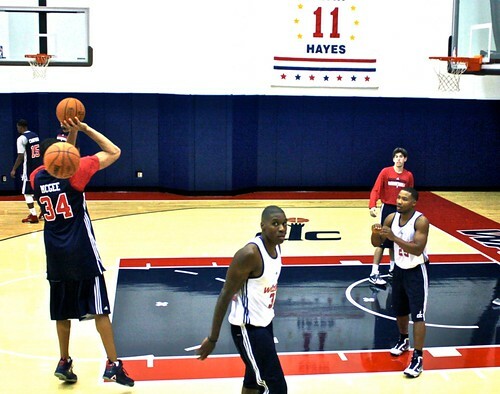 No one is quite sure which JaVale McGee spoke at media day, but here that guy is…. Uncut. Chick-fil-A was served to the media at Media Day.